All that is required to start Aikido is an open mind. Aikido training provides you with a way to step away from our electronically dominated stressful lives and develop meaningful connections with others. Aikido is a practice and not simply a form of exercise. Through the practice one develops physical skills as well as a depth of self awareness creating a vehicle for change and personal growth. Many new students describe increased ability to deal with stressful situations personally, in school or the work place. Long time practitioners continue to be guided by the principles practiced on the mat. In the dojo lasting friendships are formed and nourished. We offer a Free Introductory Class to all new students. Trial classes are offered on Monday and Wednesday evenings at 6:30 or Saturday at noon. 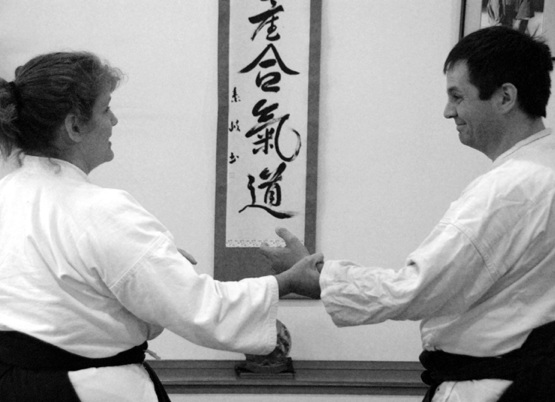 In this class you will be guided through beginning Aikido moves and introduced to Aikido philosophy by Chief Instructor Joanne Veneziano, 6th Dan and our community of practitioners. Our beginner series offers a structured introduction to Aikido philosophy, movements and techniques. Classes begin with breath, movement and blending exercises and progresses to basic techniques. Beginner level classes are offered on Monday and Wednesday evenings. It is suggested that you come and try out a class on Monday or Wednesday evenings or Saturday at noon. New students may sign up for a one or a two month special. During this time you may attend as often as you like. After the introductory special, students continuing to train are offered an additional discount during their first year of training.